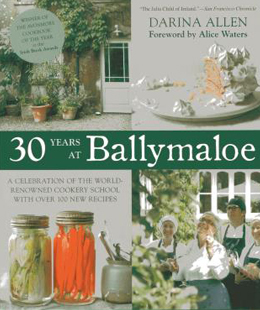 30 Years at Ballymaloe, by Darina Allen (Kyle Books, London, UK, 2014, Distributed by National Book Network, Lanham, MD). This beautiful book is not so much a cookbook (although it contains over 100 recipes) but more the story of a journey. From a culinary wilderness to the heights of excellence, a family’s journey fueled by a commitment to local food, handcrafted produce and sustainable practices. In 21st century Ireland, the Allen family is synonymous with quality food and inspired cooking. In the early 1960s, however, the country still languished in a state of post-war blandness. Long imposed frugality had generally blunted the sense of food as a source of imagination. Additionally, as noted by famed chef and co-chair of the Oxford Symposium on Food and Cookery, Claudia Roden (a contributor to the book), in those days going out to a restaurant was a rare event reserved for special occasions such as birthdays. Against that unpromising backdrop, Myrtle Allen opened a small restaurant in her rambling old farmhouse in County Cork. As a cook she was completely self-taught. As a restauranteur she had no experience whatsoever. But Myrtle Allen knew the value of good ingredients and recognized that in the lovely country of East Cork she was blessed by bounty: freshly caught fish from the nearby sea, an abundance of vegetables, free range poultry and grass fed cattle, as well as local artisans skilled in the old ways of food preparation and preservation. As Myrtle’s restaurant gained traction, she extended her culinary repertoire through courses at Le Cordon Bleu in London and L’Ecole des Trois Gourmands, co-founded by Julia Child during the 1950s in Paris. In time, the restaurant became so successful that she and her husband decided to branch out into providing accommodation. And so the legendary Ballymaloe House Hotel was born. Darina Allen, the author of this book, arrived at Ballymaloe House Hotel in 1968 as a student. She came to work in the Balllymaloe kitchen in the hope of learning some of Myrtle Allen’s skills. Coming from the industrial-style kitchens of hotel and hospitality school, Ballymaloe was an eye-opener for Darina. Unlike menus of so many restaurants of that time that stuck to the familiar and rarely changed, the menu at Ballymaloe was re-invented each day depending on what was in season and available on the farm and in the garden. The food was made from scratch: ice cream from fresh milk and cream, baby beef and pork provided by calves and pigs in the farmyard, freshly laid eggs came from the hens that were fed with scraps from the restaurant. Local children foraged for blackberries, damson plums and mushrooms and brought them to the kitchen door where Myrtle paid them generously. In 1968 Myrtle began giving cooking classes and she asked Darina to assist. In 1970 Darina became a member of the family by, as she says, the simple expedient of marrying Myrtle’s son, Tim. By 1983, having absorbed the Allen philosophy and become an accomplished chef and teacher in her own right, Darina launched a residential cooking school, the Ballymaloe Cookery School, with her brother, Rory O’Connell. Since its founding the school has gone from strength to strength, growing from an initial six-week course to courses throughout the year, as well as shorter specialized courses, that attract students from all over the world. Darina and Ballymaloe have been in the forefront of creating a new Irish culinary confidence that owes much to Myrtle Allen’s belief that quality fresh, naturally produced local food provides superb fare that is not dependent on elaborate embellishment for flavor. Darina has taken a leading role in establishing the Slow Food movement in Ireland, setting up the East Cork Slow Food Convivium at Ballymaloe which has now grown to over 100 members. Not limited in imagination, in 2013 she launched the Ballymaloe Literary Festival of Food and Wine, featuring authors, chefs, foragers, wine experts, gardeners, publishers and bloggers, among others. It was a huge success and In 2014 the festival attracted some high caliber talent: among many eye-catching offerings was a dinner cooked by Yotam Ottolenghi and a foraging workshop by Rene Redzepi of Copenhagen’s famed Noma restaurant. The Allen culinary dynasty now extends to a third generation. Darina’s daughter-in-law, Rachel, is also an accomplished chef, teacher and cookbook author. In 30 Years at Ballymaloe, Darina chronicles the saga, from Myrtle Allen’s gutsy move to open her restaurant in 1963 through 2013, with Ballymaloe established as an internationally acclaimed cookery school. Proof of the latter is attested to by Alice Waters in her foreword to the book and by contributions from luminaries such as Madhur Jaffrey and the late Marcella Hazan, who gave classes at the school at various times. In a wide range of chapters, a variety of issues are explored and experiences recounted. There are features on keeping cows, pigs and hens, food allergies, going organic, canning, sustainable fishing, self-sufficiency, butchery and starting a fruit orchard. The orchard at Ballymaloe is an example of the Allens’ dual commitment to heritage and the provision of fresh produce: it contains an impressive range of fruits (all nourished by farmyard manure, seaweed and compost) including numerous berries such as loganberries, gooseberries, boysenberries and multi-colored currants. Several fruits have been selected for cultivation in an effort to preserve and reacquaint people with their almost forgotten flavors as they are no longer easy to obtain in shops and supermarkets. Chapters on the creation of the Ballymaloe herb garden and on foraging are in themselves worth the price of the book. Darina is unafraid, however, to acknowledge occasional setbacks: she recounts an unsuccessful attempt to create a living maze and concedes that nature has a way of thwarting even the best structured plans. The Allens were inspired by traditional mazes of yew and started with the purchase of several thousand small yews that unfortunately failed to thrive, grew sickly and eventually had to be removed and replaced: proving that you can’t take for granted a happy marriage between a plant and its host soil. Fortunately, the beech and hornbeam that replaced the yew made themselves at home and 20 years later Ballymaloe has a wonderful Celtic maze, inspired by an illustration from the 9th century Book of Kells. The author provides insights about such things as kitchen equipment (she prefers Le Pentole ICM saucepans and almost anything from E. Dehillerin in Paris) to more arcane matters, like the breed of cattle best suited to provide delicious milk (Jersey), to provide meat (Kerry) and best of all, meeting a dual purpose, to thrive even on marginal soil (Kerry again). She advocates for raw milk because of its suggested anti-allergic properties and supports the spirited campaign to oppose a ban on raw milk proposed by the Irish government. It is clear that Darina Allen is no fan of mindless regulation, particularly emanating from the European Union. She notes that the imposition of increasingly rigid regulations in many areas of traditional food production are upping the cost and driving small family enterprises out of business. This is a battle for the hearts and minds that has yet to be resolved. Then there are the recipes. They cover a wide range such as gluten free raspberry muffins, pork belly with olive tapenade, wild garlic custard, deep fried squid with aioli and tomato/chili jam and chocolate and caramel mousse. Some are exotic and complex, others alluring in their simplicity. All have in common their primary reliance on fresh ingredients. The book’s text is complemented by numerous wonderful photos by Laura Edwards. Fields, gardens, cows, hens, fruits, country markets, flowers, kitchen, finished dishes: together they provide a sumptuous palate. Photos of freshly dug pink potatoes nestling in a wicker basket, an array of colored mushrooms ready for the pan, or the wonderful colors of a herbaceous border eloquently illustrate the balanced natural harmony that underlies the Allen philosophy. Photos and text together make a book that is both lovely to look at and an absorbing read. 30 Years at Ballymaloe is a book one can learn from but, above all, enjoy.